Resilience is a frequently discussed in the fields of Education, Psychology, Personal Development, Health and Business today. Earlier we introduced this important concept to our readers and shared our thoughts on how it could be brought to millions of people around the world. Personal resilience and resourcefulness are developed day by day as we deal with difficulties and challenges. Having a positive self-image is critical to be able to confront and manage fear and anxiety in life, e.g. helping someone else. We recognize that self-confidence and strong self-esteem are at the core of our ability to cope with the constant change that is our reality. Based on our experience in Education, Coaching, Neuroscience and Design and supported by a group of advisors – experts in coaching, psychology and technology – we are building programs that will be available inside PocketConfidant that develop self-confidence. We know that the happier and more confident we are, the more relaxed, comfortable, and at ease, which naturally puts others at ease; and, with these qualities, others tend to trust, respect, value, welcome, and cooperate with us more. As we learn how to best manage the situations around us in a manner that first supports our own wellbeing, we become able to support the wellbeing of others. Being able to make sense out of what is happening and find meaning in it is critical if one is to be able to manage the feelings that are aroused in a crisis. e.g. acting on your values. Finding purpose and meaning are at the core of the coaching activity. As we work through our own challenges we are seeking understanding and to find a sense of empowerment with which we can tackle our problem and move forward. The reason we have chosen to model the coach’s behavior is to be able to explore, no matter the subject, all the ways in which we can think about our challenge, understand it, what meaning it has for us and formulate a way to deal with it. Finding purpose and meaning are keys to finding the motivation to take action. Our thoughts and actions must be aligned in order for us to take effective steps forward. Optimists in general are better able to see bigger picture than pessimists. Good and bad events occurring being temporary rather than permanent. This too will pass. E.g. hold yourself and others accountable without blaming. The ability to see the bigger picture can often free us from the pain of the moment. It is a state of mind that permits other perspectives to enter our consciousness and opens us to our own creativity. While important to see “what is”, it is also very important to remember that people and events are connected into a larger energy flow and we cannot predict the future. Being able to see the big picture requires creating a bit of distance with a given situation or event, being able to step back and dissociate our focus for a moment. Coaching supports this through asking specific, efficient and well-delivered questions. While there is a huge amount of literature available in book stores and on the internet for self-coaching strategies, and one can enlist the services of a professional coach, these solutions can be time-consuming and expensive. Conversation is the best coaching tool we have…. whether it is a conversation with yourself or with someone else… or with a virtual assistant… talking and dialoguing about what you are experiencing is an efficient way to step back and find that big picture. 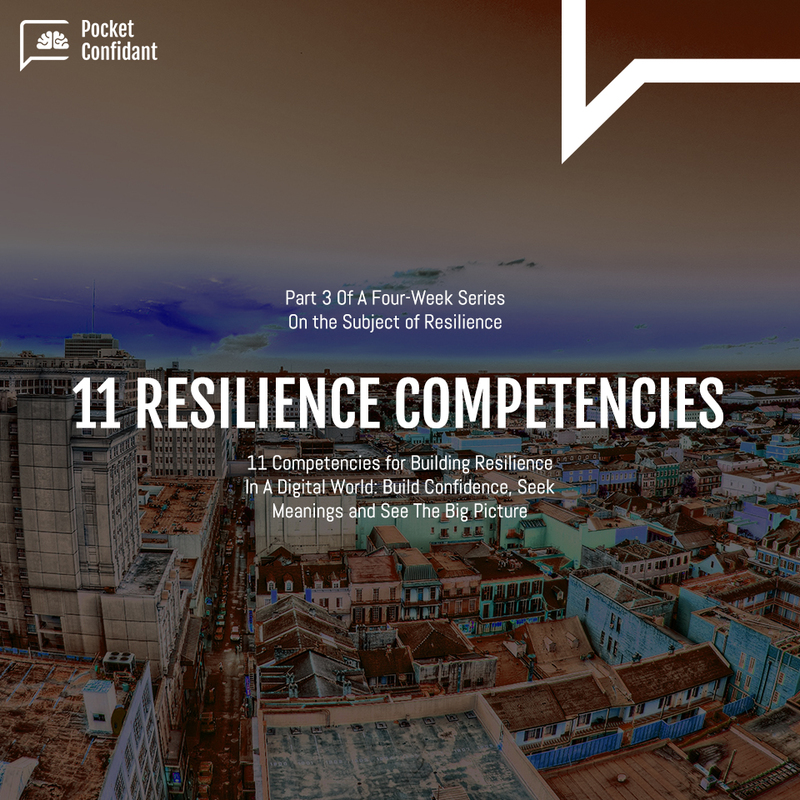 We trust you have enjoyed this third part of our article on resilience. We would love to hear from you, whether you are a follower of tech and the current conversations around Artificial Intelligence, or if you have never considered the potential of applying Artificial Intelligence in such a context. What are your thoughts? How does reading this article make you feel? Have you encountered some of the situations or skills that are mentioned here? Are you a mobile device user trying to solve personal and day-to-day life issues on your own? How do you feel about the fast pace and constant development of science and technology? Stay tuned for next weeks’ series. Contact us to share any thoughts, we will read with great curiosity and interest. Follow us on Facebook and Twitter to get the latest information.